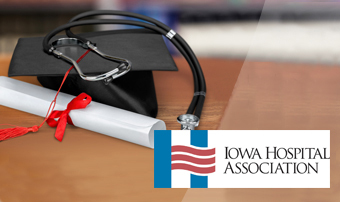 The Iowa Hospital Association (IHA) is proud to support the Health Care Careers Scholarship program. Scholarships are available through the Iowa Hospital Education and Research Foundation (IHERF), an IHA subsidiary. In 2018, IHERF expanded scholarship awards to 50 recipients. The ultimate goal of this program is to fill Iowa health care positions that currently have a notable number of openings by offering significant financial support to students seeking health care education or training. In exchange for that financial support, each award recipient must commit to working one year in an Iowa hospital for each year of scholarship award. Scholarship applications will be scored and awards made based on each applicant’s qualifications. All portions of the application form must be submitted by March 30, 2019. Submit application, including college program verification and references by March 30, 2019 at www.iowahospitalscholarships.org. Note: the website will help you confirm your scholarship eligibility before beginning the application process. Scholarship recipients will be announced after May 1, 2019. Contact Clara Stults, director of operations and information services, at stultsc@ihaonline.org or 515-288-1955.